Water tends to evaporate or vaporize by projecting molecules into the space above its surface. If the space is confined the partial pressure exerted by the molecules increases until the rate at which molecules reenter the liquid is equal to the rate at which they leave. The vapour pressure of water is the pressure at which water vapour is in thermodynamic equilibrium with its condensed state. At higher pressures water would condense. At this equilibrium condition the vapor pressure is the saturation pressure. The calculator below can be used to calculate the water saturation pressure at given temperatures. The output pressure is given as kPa, bar, atm, psi (lb/in2) and psf (lb/ft2). See also other properties of Water at varying temperature and pressure: Boiling points at high pressure, Boiling points at vacuum pressure, Density and specific weight, Dynamic and kinematic viscosity, Enthalpy and entropy, Heat of vaporization, Ionization Constant, pKw, of normal and heavy water, Melting points at high pressure, Prandtl number, Properties at Gas-Liquid Equilibrium Conditions, Specific gravity, Specific heat (heat capacity), Specific volume, Thermal conductivity, Thermal diffusivity and Vapour pressure at gas-liquid equilibrium. Engineering ToolBox, (2004). 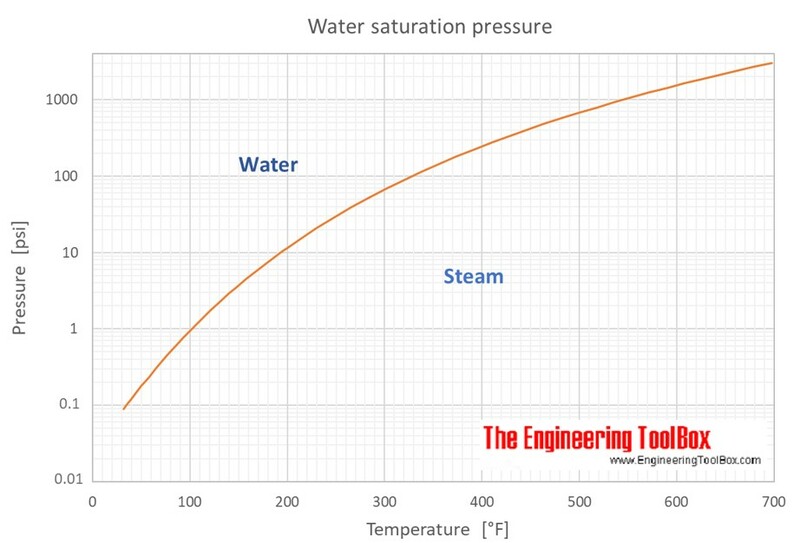 Water - Saturation Pressure. 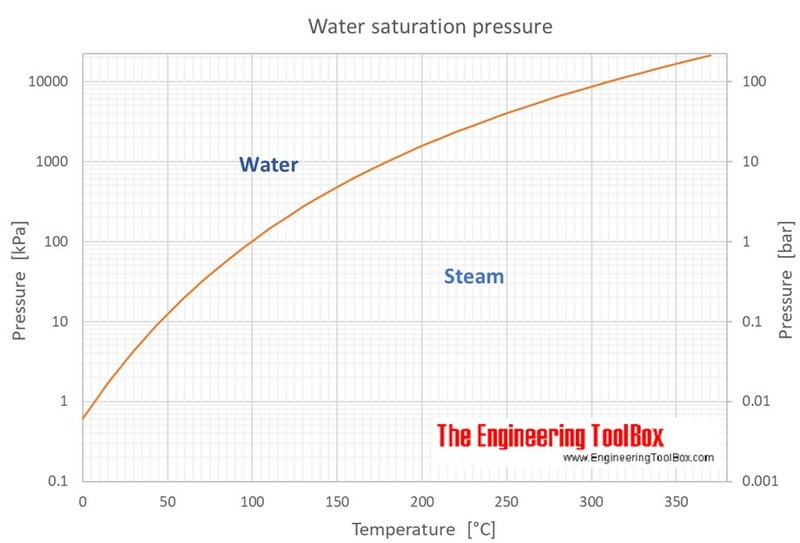 [online] Available at: https://www.engineeringtoolbox.com/water-vapor-saturation-pressure-d_599.html [Accessed Day Mo. Year].